Any significant application works with data, and providing a means for users to view, manipulate, and modify data is not a trivial task for user interface development. Fortunately, TornadoFX streamlines many JavaFX data controls such as ListView, TableView, TreeView, and TreeTableView. These controls can be cumbersome to set up in a purely object-oriented way. But using builders through functional declarations, we can code all these controls in a much more streamlined way. You can also provide it an ObservableList of items up front and omit the type declaration since it can be inferred. Using an ObservableList has the benefit that changes to the list will automatically be reflected in the ListView. Like most data controls, keep in mind that by default the ListView will call toString() to render the text for each item in your domain class. To render anything else, you will need to create your own custom cell formatting. Probably one of the most significant builders in TornadoFX is the one for TableView. 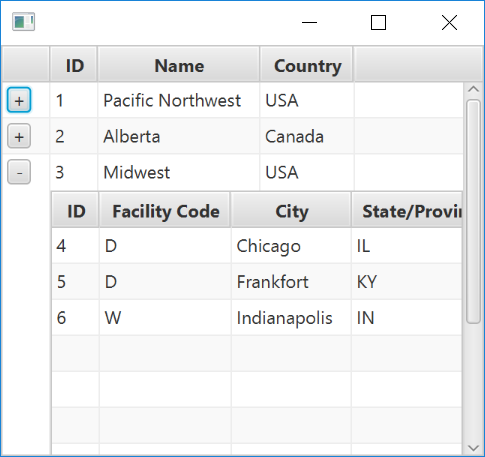 If you have worked with JavaFX, you might have experienced building a TableView in an object-oriented way. But TornadoFX provides a functional declaration construct pattern using extension functions that greatly simplify the coding of a TableView. Say you have a domain type, such as Person. Take several instances of Person and put them in an ObservableList. You can quickly declare a TableView with all of its columns using a functional construct, and specify the items property to an ObservableList<Person> (Figure 5.3). Notice the use of the readonlyColumn builder instead of the column builder. The latter is used for mutable property references, but for data classes and immutable properties we need to use the readonlyColumn builder. The column() functions are extension functions for TableView accepting a header name and a mapped property using reflection syntax. TornadoFX will then take each mapping to render a value for each cell in that given column. A corresponding readonlyColumn() function is available to map immutable non-JavaFX properties. If you want granular control over TableView column resize policies, see Appendix A2 for more information on SmartResize policies. If you follow the JavaFX Property conventions to set up your domain class, it will automatically support value editing. You can create these Property objects the conventional way, or you can use TornadoFX&apos;s property delegates to automatically create these Property declarations as shown below. You need to create xxxProperty() functions for each property to support JavaFX&apos;s naming convention when it uses reflection. This can easily be done by relaying their calls to getProperty() to retrieve the Property for a given field. See the "Property Delegates" section in Part 2 for detailed information on how these property delegates work. Now on the TableView, you can make it editable, map to the properties, and apply the appropriate cell-editing factories to make the values editable. To allow editing and rendering, TornadoFX provides a few default cell factories you can invoke on a column easily through extension functions. Choosing from these patterns are all a matter of taste, and you can use whatever version meets your needs or preferences best. 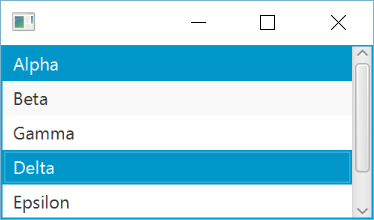 You can also convert plain properties to JavaFX properties using the TornadoFX Plugin. Refer to Chapter 12 to learn how to do this. There are other extension functions applied to TableView that can assist the flow of declaring a TableView. For instance, you can call a cellFormat() function on a given column to apply formatting rules, such as highlighting "Age" values less than 18 (Figure 5.4). It might still not update right away, even though it would eventually become consistent as the TableView refreshes. To create a binding that would reflect a change to the parent property immediately, consider using a select binding, which we will cover later. If you need to map a column&apos;s value to a non-property (such as a function), you can use a non-reflection means to extract the values for that column. Say you have a WeeklyReport type that has a getTotal() function accepting a DayOfWeek argument (an enum of Monday, Tuesday... Sunday). Let&apos;s say you wanted to create a column for each DayOfWeek. You cannot map to properties, but you can map each WeeklyReport item explicitly to extract each value for that DayOfWeek. This more closely resembles the traditional setCellValueFactory() for the JavaFX TableColumn. Later we will learn about the TreeTableView which has a notion of "parent" and "child" rows, but the constraint with this control is the parent and child must have the same columns. Fortunately, TornadoFX comes with an awesome utility to not only reveal a "child table" for a given row, but any kind of Node control. Say we have two domain types: Region and Branch. A Region is a geographical zone, and it contains one or more Branch items which are specific business operation locations (warehouses, distribution centers, etc). Here is a declaration of these types and some given instances. 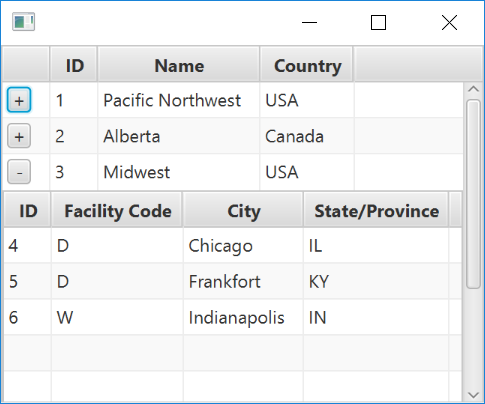 We can create a TableView where each row has a rowExpander() function defined, and there we can arbitrarily create any Node control built off that particular row&apos;s item. In this case, we can nest another TableView for a given Region to show all the Branch items belonging to it. It will have a "+" button column to expand and show this expanded control (Figure 5.5). There are a few configurability options, like "expand on double-click" behaviors and accessing the expanderColumn (the column with the "+" button) to drive a padding (Figure 5.6). The rowExpander() function does not have to return a TableView but any kind of Node, including Forms and other simple or complex controls. If you want to hide the expander column, just call expander.isVisible = false. You can also programmatically toggle the expanded state of any column by calling expander.toggleExpanded(rowIndex). Traditionally in JavaFX, populating these elements is rather cumbersome and verbose. Fortunately TornadoFX makes it relatively simple. Say you have a simple type Person and an ObservableList containing several instances. Creating a TreeView with the treeview() builder can be done functionally Figure 5.7). First we gather a distinct list of all the departments derived from the persons list. But then we put each department String in a Person object since the TreeView only accepts Person elements. While this is not very intuitive, this is the constraint and design of TreeView. We must make each department a Person for it to be accepted. Next we specify the highest root for the TreeView that all departments will be nested under, and we give it a placeholder Person called "Departments". 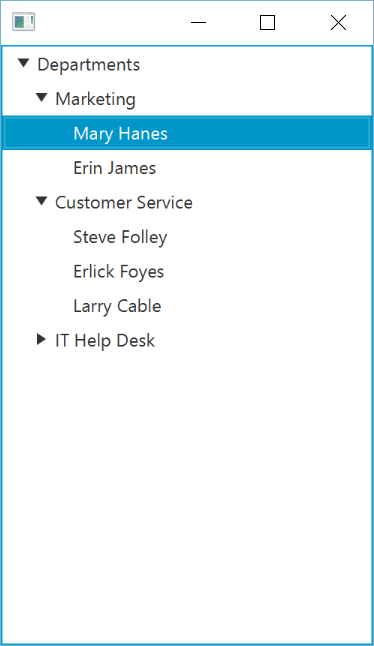 Then we specify the cellFormat() to render the name of each Person (including departments) on each cell. Finally, we call the populate() function and provide a block instructing how to provide children to each parent. If the parent is indeed the root, then we return the departments. Otherwise the parent is a department and we provide a list of Person objects belonging to that department. removed items will result in removed TreeItems as well. It is not necessarily intuitive to make every entity in the previous example a Person. We made each department a Person as well as the root "Departments". For a more complex TreeView<T> where T is unknown and can be any number of types, it is better to specify type T as Any. Using star projection, you can safely populate multiple types nested into the TreeView. For instance, you can create a Department type and leverage cellFormat() to utilize type-checking for rendering. Then you can use a populate() function that will iterate over each element, and you specify the children for each element (if any). The TreeTableView operates and functions similarly to a TreeView, but it has multiple columns since it is a table. Please note that the columns in a TreeTableView are the same for each parent and child element. If you want the columns to be different between parent and child, use a TableView with a rowExpander() as covered earlier in this chapter. Say you have a Person class that optionally has an employees parameter, which defaults to an empty List<Person> if nobody reports to that Person. Then you have an ObservableList<Person> holding instances of this class. You can create a TreeTableView by merging the components needed for a TableView and TreeView together. You will need to call the populate() function as well as set the root TreeItem. A DataGrid is similar to the GridPane in that it displays items in a flexible grid of rows and columns, but the similarities ends there. While the GridPane requires you to add Nodes to the children list, the DataGrid is data driven in the same way as TableView and ListView. You supply it with a list of items and tell it how to convert those children to a graphical representation. It supports selection of either a single item or multiple items at a time so it can be used as for example the display of an image viewer or other components where you want a visual representation of the underlying data. Usage wise it is close to a ListView, but you can create an arbitrary scene graph inside each cell so it is easy to visualize multiple properties for each item. 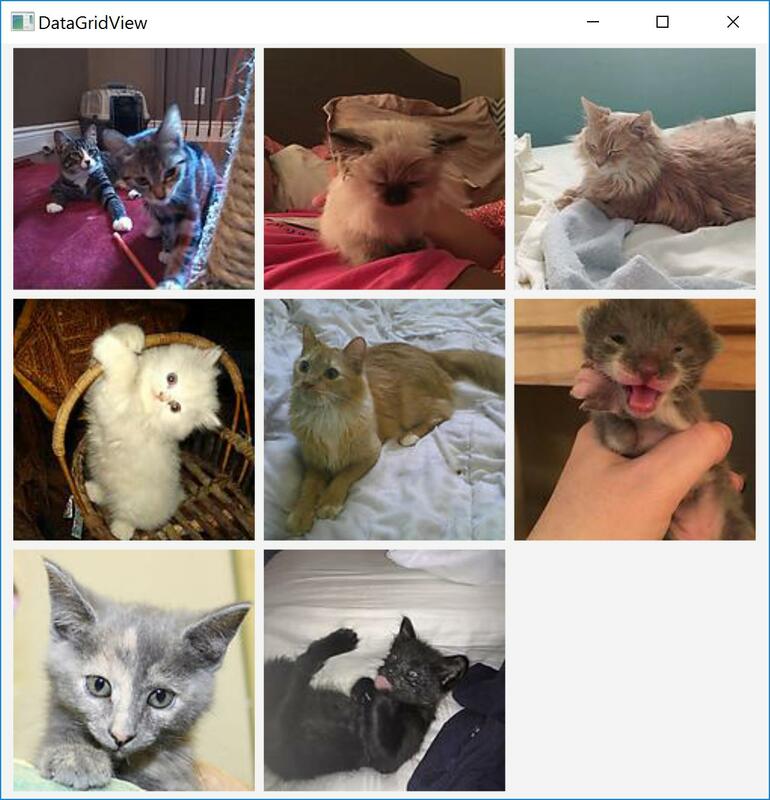 The cellCache function receives each item in the list, and since we used a list of Strings in our example, we simply pass that string to the imageview() builder to create an ImageView inside each table cell. It is important to call the cellCache function instead of the cellFormat function to avoid recreating the images every time the DataGrid redraws. It will reuse the items. The grid is supplied with a list of numbers this time. We start by specifying a cell height and width of 75 pixels, half of the default size. We also configure multi select to be able to select more than a single element. This is a shortcut of writing selectionModel.selectionMode = SelectionMode.MULTIPLE via an extension property. We create a StackPane that stacks a Label on top of a Circle. You might wonder why the label got so big and bold by default. This is coming from the default stylesheet. The stylesheet is a good starting point for further customization. All properties of the data grid can be configured in code as well as in CSS, and the stylesheet lists all possible style properties. The number list showcased multiple selection. When a cell is selected, it receives the CSS pseudo class of selected. By default it will behave mostly like a ListView row with regards to selection styles. You can access the selectionModel of the data grid to listen for selection changes, see what items are selected etc. Functional constructs work well with data controls like TableView, TreeView, and others we have seen in this chapter. Using the builder patterns, you can quickly and functionally declare how data is displayed. In Chapter 7, we will embed controls in layouts to create more complex UI&apos;s easily.